Long Arm 101 is a prerequisite for renting the long arm. 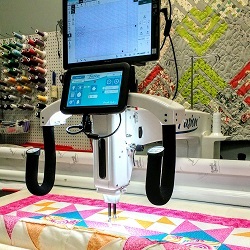 Come finish your quilt on our Amara. Rented time is for one person only. The rental is for five hours of quilting time. Thread is included in the rental. There is minimal assistance (that looks good, Oops, you need to try this). If you would like someone to help you, there is an additional fee of $45 which starts after you have loaded the quilt. If you plan on using this additional service, we ask that you schedule out two weeks and let us know so that we can have staff on hand to help you.